ActiveMax® Human VEGF121, Tag Free (VE1-H4213) is expressed from human 293 cells (HEK293). It contains AA Ala 27 - Arg 147 (Accession # NP_001020541). 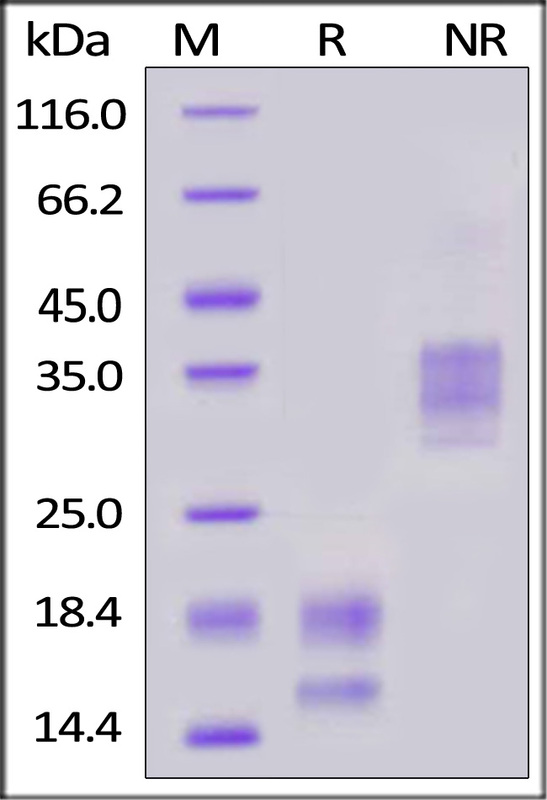 The protein has a calculated MW of 14 kDa (monomer). As a result of glycosylation, the protein migrates as 19 kDa and 20kDa under reducing (R) condition, and 40-45 kDa (homodimer) under non-reducing (NR) condition (SDS-PAGE). 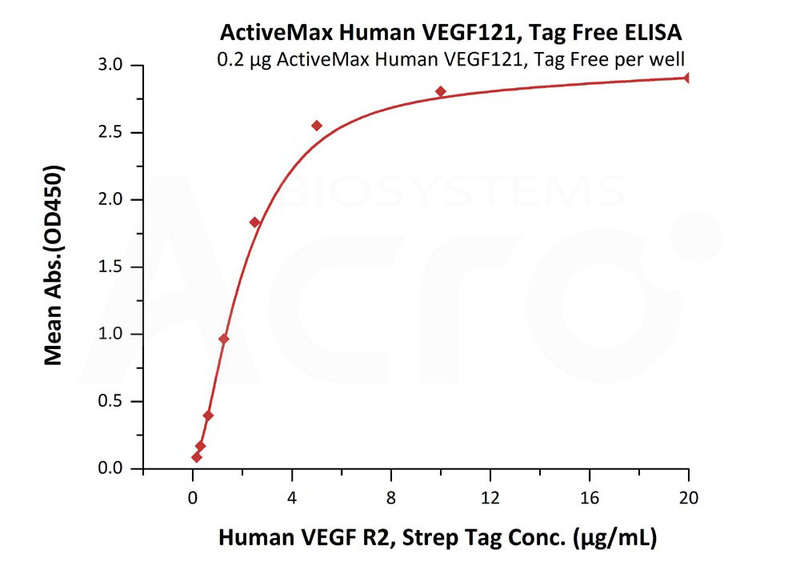 ActiveMax® Human VEGF121, Tag Free on SDS-PAGE under reducing (R) and non-reducing (NR) conditions. The gel was stained overnight with Coomassie Blue. The purity of the protein is greater than 95%. Immobilized ActiveMax® Human VEGF121, Tag Free (Cat. No. VE1-H4213) at 2 μg/mL can bind Human VEGF R2, Strep Tag (Cat. No. KDR-H5280) with a linear range of 0.15-2.5 μg/mL (QC tested). Authors: Stafford RL, et al. Vascular endothelial growth factor (VEGF) is also known as vascular permeability factor (VPF) and VEGF-A, and is a member of the platelet-derived growth factor (PDGF)/vascular endothelial growth factor (VEGF) family and encodes a protein that is often found as a disulfide linked homodimer. This protein is a glycosylated mitogen that specifically acts on endothelial cells and has various effects, including mediating increased vascular permeability, inducing angiogenesis, vasculogenesis and endothelial cell growth, promoting cell migration, and inhibiting apoptosis. Alternatively spliced transcript variants, encoding either freely secreted or cell-associated isoforms, have been characterized. Alternatively spliced isoforms of 121,145,165,183,189 and 206 amino acids in length are expressed in humans. VEGF165 appears to be the most abundant and potent isoform, followed by VEGF121 and VEGF189. VEGF121 is the only form that lacks a basic heparinbinding region and is freely diffusible. Mouse embryos expressing only the corresponding isoform (VEGF120) do not survive to term, and show defects in skeletogenesis. Human VEGF121 shares 87% aa sequence identity with corresponding regions of mouse and rat, 93% with feline, equine and bovine, and 91%, 95% and 96% with ovine, canine and porcine VEGF, respectively. VEGF121 induces the proliferation of lymphatic endothelial cells. The lymphangiogenesis may be promoted by upregulation of VEGF121, which may in turn act in part via induction of VEGF-C.